LOST is another term – aside from the lame TV-series where a rag-tag group of passengers survive, stranded on an exotic island to end-up on its ritual final episode to be in fact : DEAD – is where you will be in a unique area even my Post-Millennium, Global standards in an area where savvy consumers 24 hours, as well as boutique owners from around the Peninsula flock over the wee hours of the night . for the place is huge~ and constantly changing .. evolving in sort-of a harmonious manner, with a bulk of the classic old whole-sale buildings still intact after say, almost half a Century 0o0 ofcourse it started from rubbles right after the Korean War, with the most drastic sky-soaring developments in the last 15 years . and as in my former Life I was a traveling map-maker from Scottish HighLands to the East mountain range on the Korean Peninsula : what better way to round it all up in a series of clear, concise maps ?! even at that : the first obstacle you will face, will be many myriad of maps dotting all the buildings that adorn the area, which surprissingly seem alike but specific buildings and layout quite different (?) this is because they come from several sources, understandable as so many companies operate this area with their own agendas AND made at different times as this area is always budging as the whole-sale species evolve . at face-value, you only want to know what is currently correct, but it is a tad fun to know how each buildings have changed over the times, along with their intended target and actual clientel . 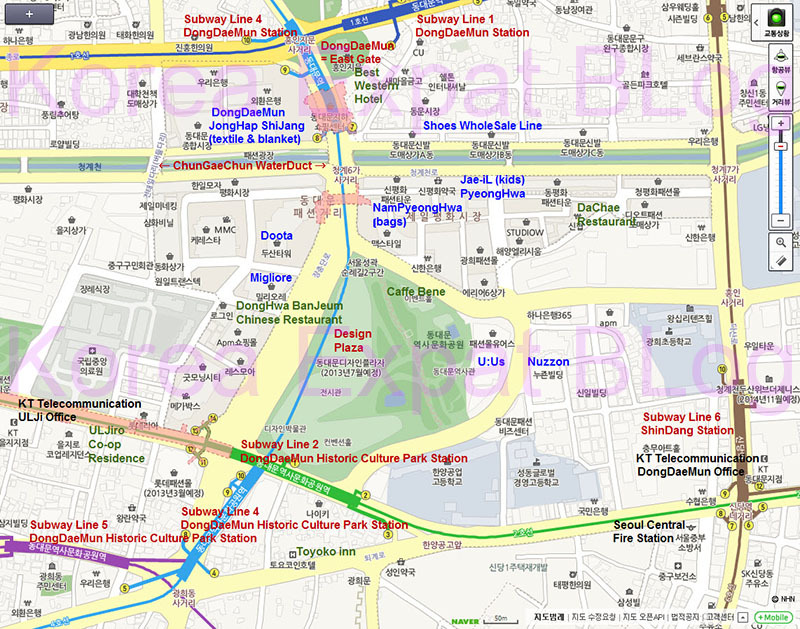 you know this is a major traffic hub, when you see FIVE subway lines inter-crossing in SIX stations around the whole of DongDaeMun Market . Im planning to visit seoul in the month of July for my clothing business. I want to explore wholesale markets for women clothes, accessories and shoes. Pls guide me with the wholesale market names or outlet names. 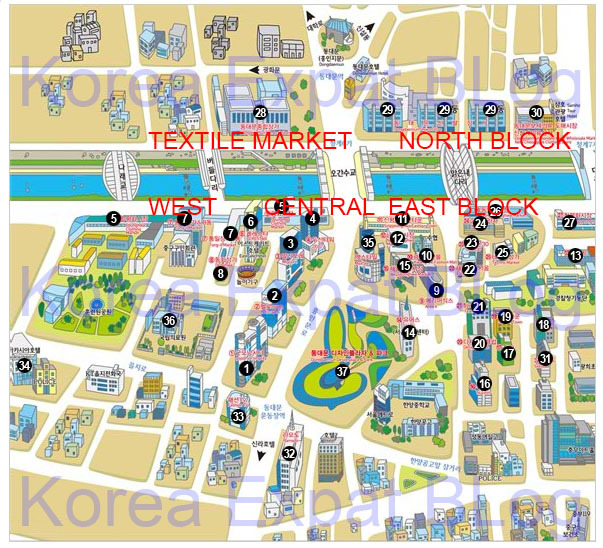 I’ll have 12 hours layover in Seoul next week and would like to go shopping for fabrics. Should I go to building 28 or 7 on your map? What exit # should I take once getting off the subway line 4? Thanks for your help. 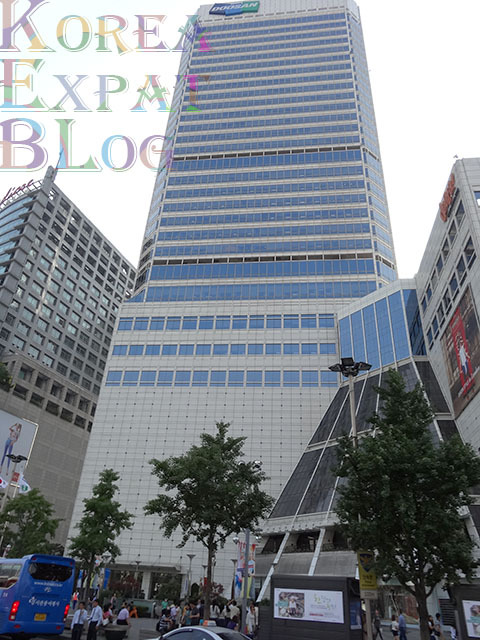 SEOUL Subway Line 4 Exit 9 to building No.28 on above map. but be forewarned this really is a maze you find in dungeon quest games, so great if you have a whole afternoon between flight connections .